The Centurion Lounges by American Express are often said to be a favorite among travelers and these lounges are available in several airports throughout the United States. 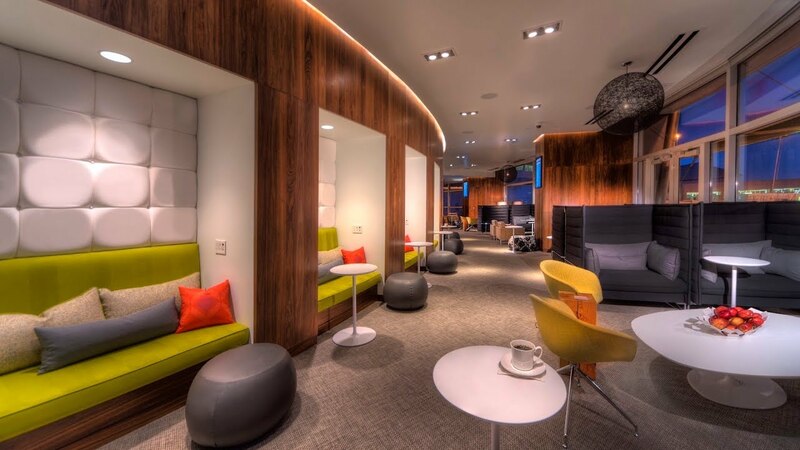 The lounge is uniquely located at McCarren International Airport given this airport isn’t a hub for any airline, unlike other Centurion lounges located at LaGuardia, Miami International, or Dallas/Fort Worth International, for example. The Centurion lounge in LAS caters to a unique clientele; those attending business conferences in Las Vegas, or those trying to make it big at one of the many casinos just minutes away. For the amenities that are reservable, these can be reserved through the front desk at the Centurion lounge. Below, you’ll find what to expect when visiting the Centurion Lounge at LAS and if this lounge is worth the hype. The Centurion Lounge is located in the Terminal 1 Concourse near gate D1. Typically, these gates usually are served by Air Canada, Thomas Cook Airlines, Hawaiian Airlines, United Airlines, American Airlines, Frontier Airlines, Sun Country Airlines, and Delta Air Lines. After you pass through the security checkpoint, navigate to the D Gates via the airport tram on the Blue Line. This 3-minute ride will take you from the main terminal entrance to D gates. Once you’ve arrived at the D Gates, you’ll find the entrance to the Centurion Lounge is directly across from D1. If you arrive to LAS on an inbound flight, you will also utilize the airport tram to D gates to visit the Centurion Lounge. Bottom Line: The Amex Centurion Lounge at LAS is located across from D1. To access the Centurion Lounge, you need to have The Platinum Card® from American Express, The Business Platinum Card® from American Express, or the Centurion® Card from American Express. With these cards, not only are you granted access to the Centurion Lounge but also up to 2 guests complimentary. If you have additional travel guests, you will need to pay $50 per person for a day pass. Traditionally, these additional passes are subject to lounge capacity restrictions and can only be purchased on the day you are traveling. Hot Tip: You need to have a same-day flight, valid boarding pass, and the applicable American Express credit card to gain access to the Centurion Lounge. Unfortunately, you cannot access the lounge without a confirmed seat assignment, so passengers who may be flying non-rev or standby without a confirmed seat assignment may be denied entry. Keep in mind, that the Centurion Lounge may limit access to within 3 hours of the boarding time listed on your boarding pass for capacity. You can access the lounge in between flights, so if you’re connecting between two cities, you do have free range use of the lounge space. For example, let’s say you were flying from Los Angeles to Chicago via Las Vegas and you had a two-hour layover, you could access the lounge during that time without trouble, even though you were coming off of your flight from Los Angeles. As mentioned above, you must have a valid same-day boarding pass. Unfortunately, this means you cannot access the lounge if LAS is your final destination and you do not have a valid same-day boarding pass out of LAS. So, if you get to Vegas off of a long flight, aren’t continuing elsewhere, and hoping for a shower, you’re going to be out of luck when it comes to accessing the Centurion Lounge upon landing in LAS. Once you pass the entrance door, you will see the customary greenery backdrop and attendants at the front desk eagerly waiting to offer you assistance. A welcoming tranquil environment in the middle of a busy airport. Image courtesy of americanexpress.com. Usually, you will not have to wait very long to see a host, and the attendant will welcome you, ask for your identification, boarding pass, and your American Express card. If you are a cardmember of the Platinum Card®, Business Platinum Card® or Centurion Card, and are eligible for lounge access, you will be given a quick summary of all the amenities available for you inside, and assistance with Wi-Fi access. Inside is a fashionable and sleek décor that is present throughout the entire lounge with the white walls perfectly paired to the wooden accents, and the floor consisting of a combination of a patterned carpet and hardwood. This combination creates a fun vibe within the lounge. You’ll notice this color scheme is similar to other Centurion Lounges. Additionally, this lounge is divided by a central wall with seating, food, and work stations on every side, with the left side featuring more private seating. The right side, however, is less secluded and has a better view of the tarmac. Bottom Line: To enter the lounge, you’ll need a same-day boarding pass and either a Platinum or Centurion card. The lounge has approximately 175 seats and is quite expansive, with a broad variety of seats available. This is undoubtedly more than enough for everyone entering the lounge at any given time. Seating options include in-built bench seats with colorful cushions, stuffed leather chairs, and semi-private seats that are reminiscent of pool-side cabana chairs. The seat types can address the needs of everyone, whether you are seeking somewhere to relax, eat a hearty meal, or to have a quick snack. Seating in the Las Vegas Centurion Lounge is plentiful with views of the runway. Image courtesy of americanexpress.com. It is the one area where the Centurion Lounge at Las Vegas really excel. The lounge offers a wide range of dishes, including a full buffet typically complemented with exotic dishes from various parts of the globe. Kim Canteenwalla, a James Beard Award-nominated chef, is the resident culinary guru, sourcing all ingredients locally when possible. These dishes usually get rotated depending on the season. If you are hungry and looking for a good meal, the lounge has you covered since the food is exceptionally delicious compared to other airport lounges. Even if you’re not hungry, the food offerings will tempt you to grab a bite. Depending on the time of day, breakfast, lunch, or dinner will be offered. If you are into trying out some award-winning food, the Las Vegas Centurion Lounge is the place to be whenever you are flying out of this airport, and if you are a James Beard chef enthusiast, look no further. Hot Tip: The cookies are incredible. On your way out, grab one of the signature chocolate chip cookies. Or grab two or three! The Centurion Lounge at Las Vegas’ bar is an excellent place to socialize as you await your flight, and its menu is a significant upgrade to the other, outdated, airline clubs that only offer house liquors. In the Centurion Lounge, the drinks available to you include top-shelf vodka, sparkling wine, beer, as well as cocktail mixtures. Jim Meehan, one of the United States’ foremost mixologists, is the brain behind most of the craft cocktails. While the drinks are free, it’s customary to tip the bartender or server. Inside the Centurion Lounge at LAS, a shower suite is accessible to all guests. However, only one shower is available, and getting access to it can be tricky since reserving it is on a first come, first served basis. The lounge attendant at the front desk keeps the waitlist to ensure the first come, first served order. The showers are fully stocked with towels, soaps, and other basic amenities, so you don’t need to worry about bringing these from home. The shower suite also has a toilet and sink so you have everything you need to feel refreshed before your flight. Hot Tip: The Shower Suite requires a reservation at the front desk, so allow plenty of time before your flight if you wish to grab a shower. There are also desktop computers and a printer available and come at no cost to use and printing is free. The lounge also offers 4G Wi-Fi with download speeds of up to 80 Mbps, which is unbelievably fast for public internet. With that speed, the lounge is a great place to get work done, check some emails, or even download some large movie files before your flight. Hot Tip: The lounge is a great place to download movies before your flight since the Wi-Fi is super fast. The lounge has a soundproof family room where kids can play while you wait for your flight. In the family room, children have several toys to play with along with a television. While not as exceptional as the other parts of the lounge, it’s a great place to have the kids play before their flights. The family room is open to anyone within the lounge, and you don’t need a separate reservation to use the family room. This is really a great feature so your children can play, giggle, and scream, without you having to worry about the noise impacting other travelers. 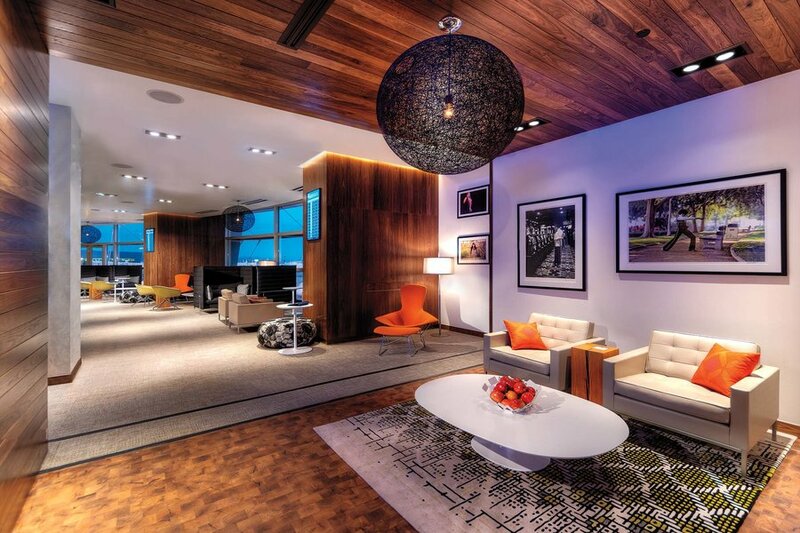 Getting to relax in the Centurion Lounge at LAS offers you much-needed amenities as you await your flight. The atmosphere and design are enjoyable, though some have commented about the boxier look of this lounge compared to other Centurion Lounges. Nonetheless, there is a lot of space available, and a majority of the seats face the tarmac where you have an excellent view. The seats in this lounge are incredibly comfortable and sure beat what you will find in the gate areas. The general atmosphere is inviting and relaxing, plus the staff is very friendly and approachable. The drink and food options are fantastic and outshine the usual food outside in the terminal. 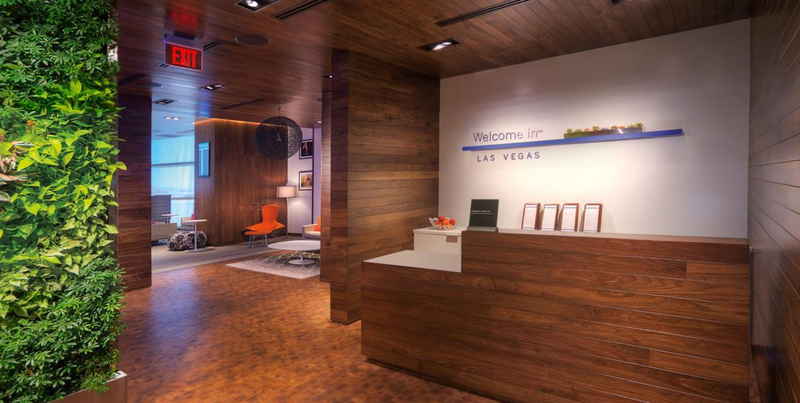 What credit cards do I need to access the Las Vegas Centurion Lounge? To access the Las Vegas Centurion Lounge, you need either an American Express Platinum Card®, The Business Platinum Card® from American Express or an American Express Centurion card. Where is the Las Vegas Centurion Lounge located? The lounge is located in the D terminal, directly across from gate D1. The lounge is fully accessible from other parts of the airport, and you can access it by taking the inter-airport train.